Not many games have you take the role of a zombie, but Zombie Dice does just that. You’re on the hunt for “brains.” Cue the shuffling zombies. The goal is simple. You have to collect brains before your victims run away or shoot you. The rules are equally simple. 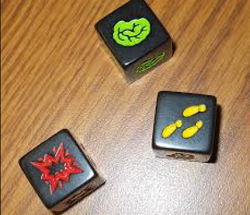 At the start of your turn you grab three zombie dice from the dice canister. Each die has different colors—representing how difficult the victim is to kill with green the easiest, yellow the intermediate victim, and red the hardened cuss of a victim—and these dice have three faces: brain, shotgun blast, and feet. You try to roll brains, while not rolling shotgun blasts or feet. If you roll three shotgun blasts, your turn is over and you lose all of the brains you accumulated during the turn. So while it is possible to roll three shotgun blasts in a single roll, you usually won’t get that many, and you’ll have to decide whether or not to press your luck with another roll of three dice. Any feet you roll are returned to the dice canister. A game ends when one player rolls at least 13 brains. Every other player gets to take one more turn to see if they can tie or beat the player who passed the 13 mark. Perfect for families, children or even if you want a quick game to fill the time, Zombie Dice doesn’t take long to play, but it’s hard to play just one game. There isn’t a lot of strategy involved in Zombie Dice besides when to hold the points you accumulated and when you should press your luck and roll another three dice. I’ve found that 12 brains is the best total. You can hover just before the 13 brains that will start the end game and see if you can’t bring your total to 15 or 16 before passing the finish line, or if someone passes you while you have 12 brains, you have a great position to overtake them with your final turn. Zombie merchandise is hot right now. If you’re looking for an involved zombie game, look elsewhere. 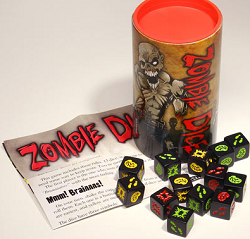 But if you’re looking for a fun, easy game, it doesn’t get a lot better than Zombie Dice. Verdict: A quick, easy game where you are a zombie hungry for brains. It may not have a lot of strategy or complexity, but it makes up this shortcoming with a healthy dose of fun.